Japanese Episode AG 094: "Jiiransu to Shinkai no Hihou!" American Episode 366: "The Relicanth Really Can"
Satoshi and his friends have stopped by Wazuwa Island to relax at the island's beautiful beaches. Suddenly, the group is approached by a man named Souya, who announces that he's found a great treasure! Our heroes are intrigued by this man, so they follow him to his shop, where his wife, Erimo, informs the group that the treasure isn't all that great. Souya tells Satoshi-tachi that his ultimate goal is a treasure hidden in a sunken ship, and he thinks that the pokemon Jiiransu is the key to finding this ship. Satoshi and his friends decide to tag along, and before long the five adventurers are in a submarine headed for the bottom of the ocean. A Jiiransu is spotted heading into an underwater current, so Souya decides to follow. The current dumps the submarine off into an underwater cave, where Souya is delighted to see the sunken ship! Souya goes into the ship and retrieves the treasure, but the Rocket-Dan appear and steal the treasure! 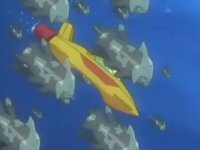 Souya follows the group's Koiking sub to the surface, where Satoshi-tachi's pokemon work together to defeat the Rocket trio. Souya's treasure is retrieved, but when he opens the chest, he's dismayed to find a box filled with more worthless jewels! Emiro tells her husband that they can use the gems to make jewelry that can be sold in their shop, causing Souya to cheer up. Now that Satoshi-tachi's deep sea adventure has come to an end, our heroes continue on their journey through Houen. "Bad twerps, BAD! Didn't their parents ever teach them about not going off with strangers ^^. It only leads to pointless filler." Souya (named after the Souya Cape, located in northern Hokkaido) and Erimo (named after the Erimo Cape) were some of the most forgettable filler characters ever, and Jiiransu really didn't do much of anything to make it stand out. The only good parts, once again, came from the Rocket-Dan, who seemed to have remembered their violent streak that they had way back in Kanto. I mean, firing missiles at a bunch of fish pokemon? Talk about ruthless. The dubbed version isn't anything special. The dub calls the ship that everyone's searching for "The King Neptune," but as far as I can tell, it's just referred to as a "sunken ship" (chinbotsusen) in the Japanese version. The music used in the dub sounds different from the stuff they usually use (I think they used more stuff from the soundtracks of the first three movies), but other than that, everything's business as usual. And for those of you wondering, yes, Souya repeats the whole "man of the sea" thing over and over in the Japanese version as well. Then, two seconds are cut from the episode's title screen, just like the last episode. It's looking like this will be an ongoing edit through the rest of the season. Whenever Erimo and Souya talk to each other through the radio in the Japanese version, the voice sounds distorted. You know, like how you'd expect a voice over a walkie talkie to sound. In the dub, however, there's no distortion at all, and everyone sounds like they're talking to each other in person instead of from a submarine at the bottom of the sea. It's a small difference, I know, but it makes the Japanese version sound that much more realistic. Jessie: "I want that treasure even if it means following this Relicanth all the way down to China!" Originally, there's no real world reference here; Musashi simply states that they'll pursue Jiiransu to the ends of the Earth. China isn't mentioned at all in the Japanese version. The rest of the episode's edits are just time cuts. Two seconds are cut from the shot of Satoshi after the Trainer's Choice commercial break. And finally, two seconds are trimmed from the scene right after Kids' WB! 's final commercial break. Amazingly enough, the TO BE CONTINUED... screen isn't shortened at all in the dub.